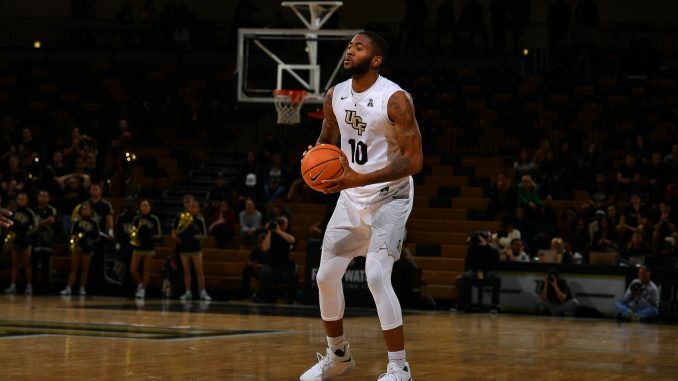 The UCF Knights used a hot offensive second half and opportunistic defense to beat the Memphis Tigers 65-56 Wednesday night at CFE Arena. Just like many games before this one, the Knights (11-4, 2-1 AAC) came out cold on offense, scoring only 21 points in the first half, in part due to shooting 1-11 from three. Despite the low first half offensive output, the Knights went into halftime only down by one thanks to a defense that allowed just 22 points and forced 10 turnovers. The offense came alive in the second half, as UCF more than doubled it scoring output from the first. A 14-3 run midway through the second half helped them get out to an eight-point lead in a game that they had trailed in up to that point. The game got within four later in the half, but UCF was able to keep Memphis (9-6, 0-2 AAC) at arm’s distance, and was able to hit enough free throws at the end to put the game away. The Knights hit 5-7 threes in the second half and finished the game shooting 43.5 percent from the field. Four players finished in double figures, led by redshirt senior A.J. Davis, who hit 11 of his 16 free throws en route to 16 points and 11 rebounds – his fifth double-double of the season. He was followed by redshirt freshman Caesar DeJesus with 14 points, redshirt junior Dayon Griffin with 13, and junior Tacko Fall with 10. Memphis was led by Kareem Brewton Jr., who had 15 points and Kyvon Davenport, who had 11. UCF is home against the Temple Owls on Sunday. Tipoff is set for noon. Zack Winiecki is a staff writer for Knight Sports Now.